What would it look like if cities could harvest power from water pressure moving through municipal water pipelines? Since 2012, Riverside, California has been putting that question into practice, and now Portland, Oregon is adopting the approach as well. A Portland-based company, Lucid Energy, has designed a system that generates electricity from simply flushing a toilet or turning on the tap. 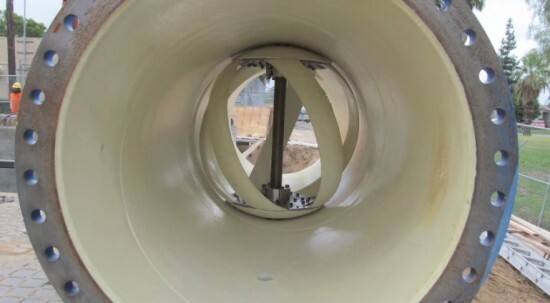 The system requires gravity-fed pipes to do it’s work: pipes come with up to four mini-turbines and four external generators to remove excess water pressure. A 42” diameter one mile pipeline can generate over 3 megawatts of electricity. Estimates say the Portland system will be able to power about 150 homes, generating 1,100 megawatt hours of energy each year. The Portland system is financed by Harbourton Alternative Energy (a subsidiary of Harbourton Enterprises). “Over the next 20 years, it should also generate about $2 million in energy sales to Portland General Electric, which Harbourton plans to share with the City of Portland and the Portland Water Bureau to offset operational costs. At the end of that period, the Portland Water Bureau will have the right to purchase the system outright, along with all the energy it produces,” writes gizmag. While installation on a main Portland pipeline was finished this past December, the system won’t be fully running until March.